Honey.....the NASCAR folks are here! We're proud alumni of THE Ohio State University and big Jimmy Buffett fans. Tailgating is nothing new to us. This is, however, our first time being in a city where the NASCAR guys come to town. And with them, of course, their fans. We had some of the workers in early who detailed the cars, but now we're getting the true fans of the race coming in and decorating their rigs. and the party is seeming to begin here at the Indianapolis KOA. Not everyone knows how to raise a dog. Our dog is by no means "well trained", and often has some bad leash aggression. That being said, she loves the dog park. You can water ski behind her if she thinks she's going there. She will figure out every possible way to get there and lead you there on a walk. I'm learning some clues, though, when it's best to not take her in there. We're a big Dog Whisperer fan, and if you know who "Cesar" is, you know what I mean. 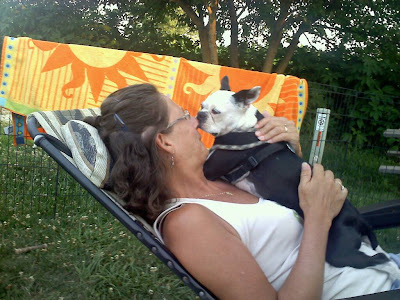 He is constantly talking about owners who transfer their fears through their leash. I'm getting to the point that if I see someone leash there dog at the sight of ours coming into the park, I'm not going in there. They don't have a clue and there's no sense in trying, in the short time we're in there, to change their mind. 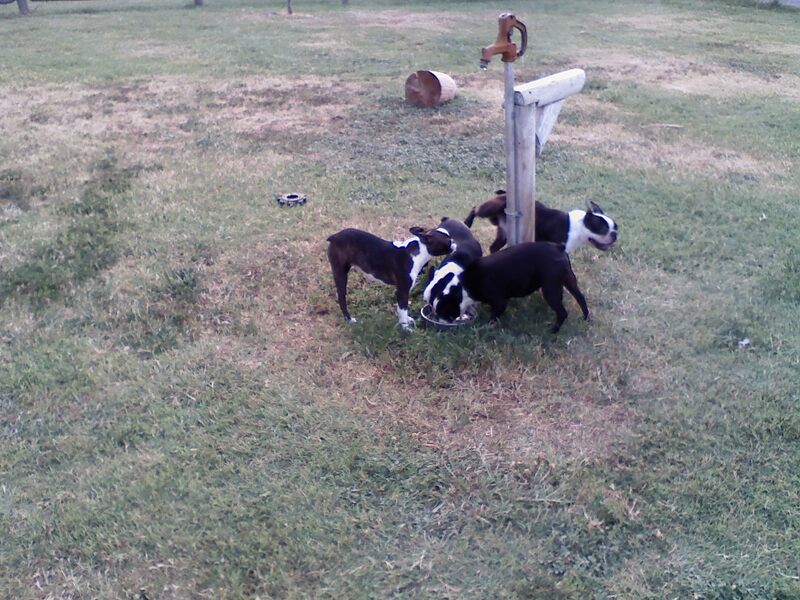 Dogs work things out, and dog parks are wonderful examples of that when owners can take a deep breath and let dogs play, sniff, and pee everywhere. It's what they do. The other thing is certain breeds with "their" balls. If I see a Jack Russell in the park doing retrieves with their owner, I'm out. 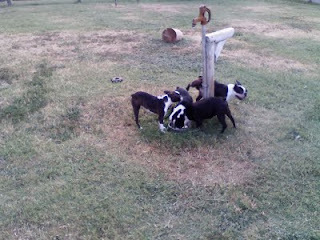 Those little guys are incredibly possessive, and our poor little Boston just sees "a" ball, not "their" ball. That took two times of her getting scraped up by those little maniacs to learn that lesson. Dog Parks are two things, the dogs and their owners. Make sure you can get a feel for them both before you put your baby at risk. 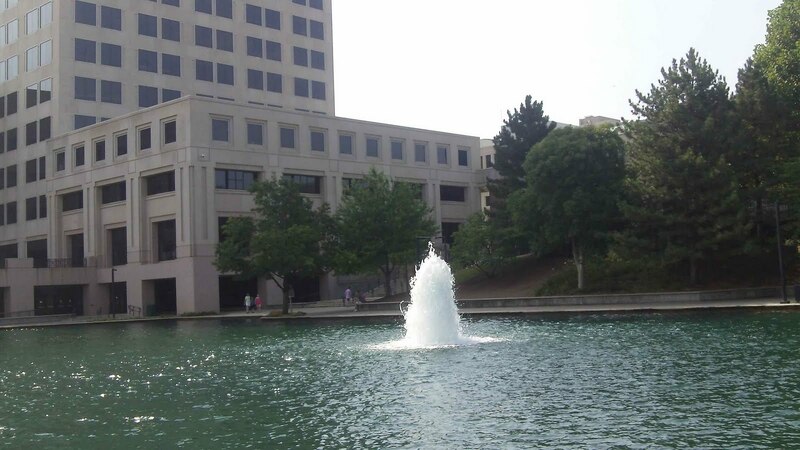 Another Great Day in Indy! The hits just keep on coming! Yesterday wasn't much to talk about, Mondays are usually pretty busy at the business. We did have a flyover by the DirecTV blimp, which I think is being housed at the Indianapolis Regional Airport just north of here. Will probably see her more this week with the NASCAR Brickyard 400 in town. Worked this morning, then headed to David's Bridal and Men's Wearhouse (practically next door to each other) and Bob got sized for his tux and Connie get her dress. What a racket is all I'll say. 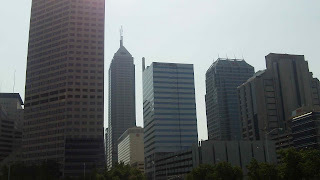 Then we headed for the Indianapolis Motor Speedway, home of this weekend's Brickyard 400. Third time we've been there, but the first time since the late 80's when Bob's high school band played in the pre race parade for the Indy 500. Took the $5pp tour around the track with a nice narration track (we were the only two in the coach). That straightaway feels so narrow, I can't imagine what it's like in one of those rockets on wheels, let alone the taxi cabs that will be there this weekend. Very cool to see the strip of bricks and the winner's circle, though. We've been to Indy a few times, so we're looking for a couple of things to go see and get us out of the rig on these hot days. 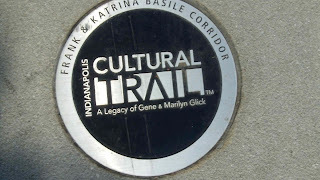 We chose to go to the Canal and White River State Park. 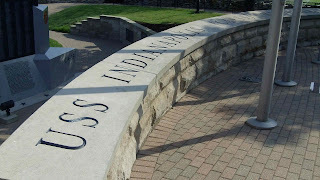 We started with the USS Indianapolis Memorial. The USS Indianapolis was the ship to transported the Atomic Bomb during WWII. It was so secretive, that when it was torpedoed on July 30, 1945 by the Japanese, it wasn't missed. Of 1,196 men on board, approximately 300 went down with the ship. The remainder, about 900 men, were left floating in shark-infested waters with no lifeboats and most with no food or water. The ship was never missed, and by the time the survivors were spotted by accident four days later only 316 men were still alive. 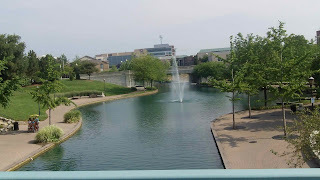 Indy has done a terrific job of upgrading their downtown living around the canal. Beautiful condos overlooking the walk. Has to bring a ton of people downtown. Got to see a stadium! We toured Lucas Oil Stadium (home of next year's Super Bowl and the Big Ten Championship) last year. Here is the home of the AAA affiliate of the Pittsburgh Pirates, the Indianapolis Indians. This has been a bit of a AAA tour. 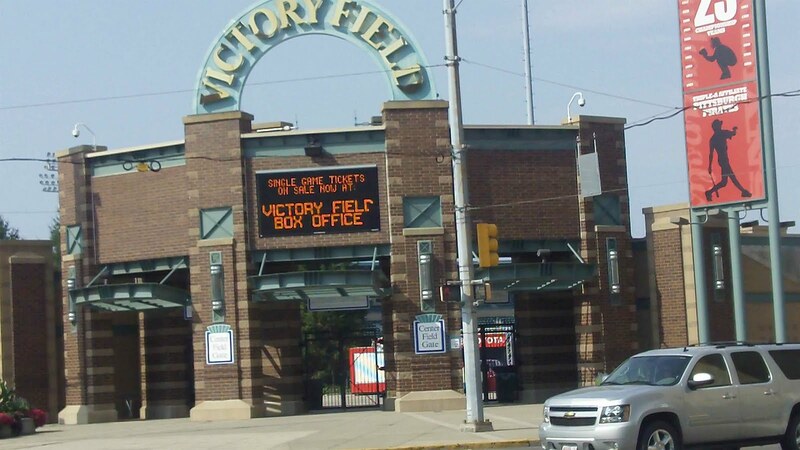 Starting with Tucson (AAA home of the Padres), we've been to Albuquerque (AAA home of the Dodgers), Oklahoma City (AAA home of the Astros) and now Indianapolis. 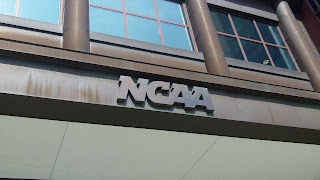 We also saw the home of the NCAA and Hall of Champions. I believe this is where the Tournament Committee meets to decide the March Tournament. 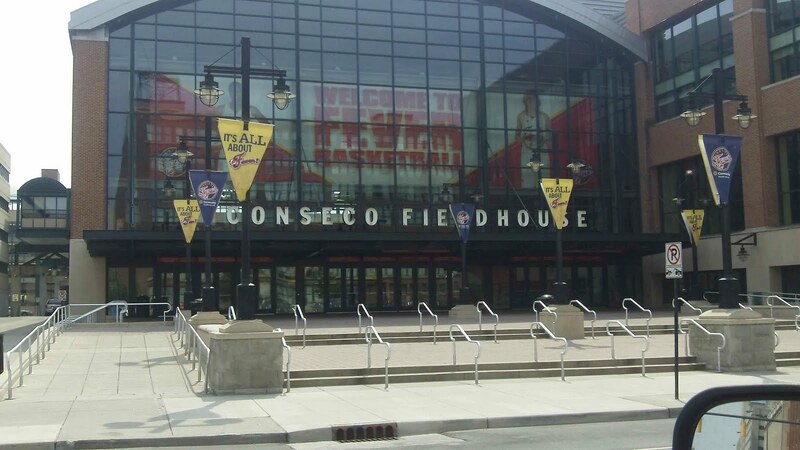 And finally, we saw Conseco Fieldhouse, NBA home of the Pacers and home to the Big Ten Tournament on a number of occasions. So we bought a grill a month back for a few reasons: it had two burners, a built in thermometer and would fit in the truck when we load up and roll to the next stop. Did my first smoking attempt on this grill tonight and it was delish! Had a half rack of ribs left over from a while back. Connie put a rub consisting of brown sugar, garlic salt and paprika on them, I put my smoker box with apple chips on the opposite burner and smoked those babies with indirect heat for almost five hours. Put BBQ sauce in our pot for the fourth hour, then started applying the sauce a half hour later. Put a couple of baked potatoes on in the second hour and moved them over direct heat on the warming rack for the last two hours. There are many options to do this. Some like to use the ready made crusts. We like to use dough. We used to use fresh dough from Walmart. However, as we move around, we found that not all of them carried that. Our latest find is the Rhoades Bread frozen dough. 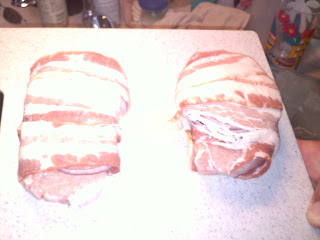 Simply set it out in the afternoon to thaw and it will be ready to roll out in time for dinner. Once the dough has thawed and is at room temperature, roll out. Tip: spray the work area with non-stick cooking spray. Works better than flour and keeps the dough moist. Be sure to spray the pizza pan too. After rolled and positioned on the pan, let rest for a few minutes. Then, preheat the grill. We turn both burners to low which gets it up to approx. 300 degrees. Use a fork to pierce the dough so it will not get too puffy when baking. Place on grill and bake for 10 minutes. We had previously cooked the chicken breast. While the crust is baking, cut up the chicken and pineapple. 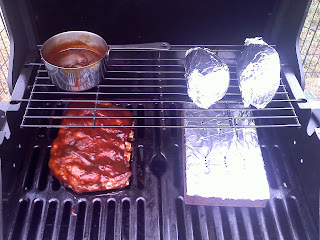 Baste the crust with barbecue sauce. Then, place the chicken and pineapple around. Top with mozzarella cheese. This is the second state we've been in where you buy your beer warm and it's testing my planning patience. Especially now, it's 4:30p, I've worked all day, and now I have to go buy ice (I call it an ice tax) to chill our beer. Everywhere we've been this year, the weather has been record breaking! Starting with Baytown (TX), where we had record lows for a week, in Tucson, then on our return in Oklahoma City and now in Indianapolis we've had record highs! It's us. I know it's us! Not often (enough) we get to entertain, but our future son-in-law's parents came over tonight (her brother lives close) and we had a terrific dinner get together! For the next five days: "The combination of temperatures in the 90s...and dewpoints in the mid to upper 70s...will produce dangerous heat index values of 105 to 110 degrees from late morning into early evening each day." If I wanted to stay in Louisiana, I'd have stayed in Louisiana! From the firepit to the fan! Last night we were enjoying a fire in the pit on the patio. Tonight, the heat is back and we are running the fan. Enjoying the evening listening to the Buffett concert and watching the Reds and Indians on TV (we flip back and forth). Hope you are enjoying your evening too. First patio fire we have had since Tucson in the winter. 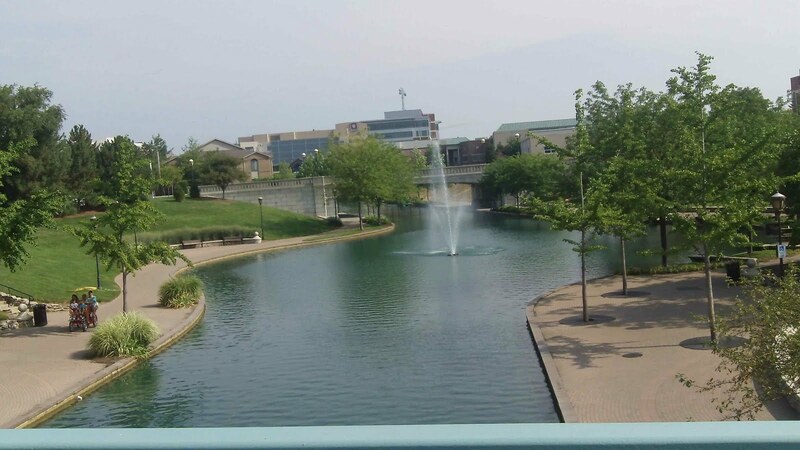 Beautiful eve here in Indy. Just wanted a little warmth and bug control. Great weekend kickoff. Laundry - what a dirty word! No matter how hard we try to keep up, it just never seems to go away. Since it is such a recurring item, we have added it to our monthly budget. This has become a little bit of a challenge with all the various rates that are charged. We have found everything from $1.25/wash to our current rate of $2.00/wash. Dryers have been ranging anywhere from .25 for 5 minutes to $1.75 for 45 minutes. The washing cycle is what it is. Not sure why there is such a difference in the price from area to area. May be that there utility rates vary that much. Or, they just want us to pay for the convenience. I certainly haven't seen that much of a difference in the facilities or the equipment. Would like to hear how others take care of dirty laundry. What are some of your experiences? Do you use the campground facilities? One of the things we think we're going to like is the familiarity of a return to an area. 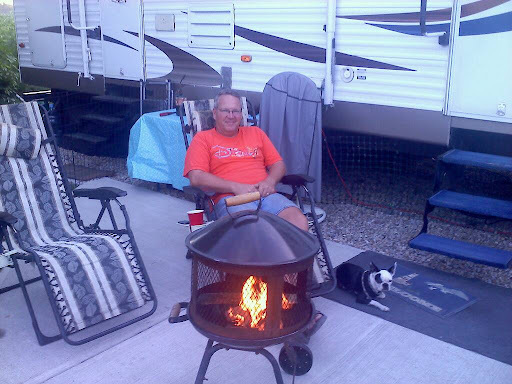 We were here at the Indy KOA last year for about 10 days. As we return this year, all the things from last year are flooding back: where the grocery is, Indiana only sells warm beer, the construction that was here last year (and is still here this year), the back way for the scooter to the Wal Mart, even the fact that they don't have mail service that comes to the office, the office has to go to the box and pick up. No RV was designed for full time use. We're reminded of that every once and while. This past weekend was one of those times. Noticed in OKC before we left that it looked like a tire was slow leaking. Sure enough, she kept losing air each stop, so that was a concern. Then you get to thinking that those tires were purchased in Florida in 2009, ridden back to Ohio, ridden out to South Dakota, Colorado, back to Maryland, then back to Ohio. Ridden down to South Carolina, Florida then out west to Tucson and back to (so far) Indianapolis. That's not the normal life of a trailer tire. We also put an over the door shoe organizer on one of our sliding bedroom doors for our shoes. The weight of that, plus the bouncing as we re entered the mid west, pretty much brought down that whole sliding door assembly, which was only being held with a few drywall screws. Another upgrade needed. When we stayed overnight at the Amarillo Elks Lodge going from Albuquerque to Oklahoma City, we said the next time we did this, we should unhook and stay two nights, leaving the day in between as a drive around the area day. Because I can't count days making our upcoming reservations (for some reason thought it would take us 3 nights instead of two to go from OKC KOA to Indianapolis KOA), that turned out to be the case today as we unhooked last night at the Springfield MO Elks Lodge, and drove today down to Branson, MO. Having been to Pigeon Forge/Gatlinburg Tennessee before that was kind of what I was expecting. About what we got, although the theaters are everywhere. Very spread out. Table Rock Lake was a nice bonus, we also enjoyed driving around the State Park. Today is the day before "Get Away Day" which is "Tear Down Day". Each place we go, we like to have a familiarity of our setup -- two tables outside, solar ground lights, X pen for the dog, raft under the rig, etc. Just makes us feel more at home. Whereas we used to tear down the morning of Get Away Day, now we seem to do things a bit more leisurely. Of course, another record breaking heat day slowed us a bit, also. Biggest thing is getting the scooter in the truck, which starts the whole process of loading. Not sure if everyone has a packing list, but I need one for the order of everything that goes into the truck (to give us that Beverly Hillbillies look as we travel) and to make sure I don't forget anything. We've never been one to be all hooked up and roll out of the park at the crack of dawn. Our traditional time to be on the road is 10 a.m. We'll do breakfast, finish packing inside and out, take our showers when we're finished and dump the sewage last thing before we pull out. Just makes us feel good on the road. Will be blogging from the road the next two days. Staying at the Springfield (MO) Elks tomorrow night, a Wal Mart to be determined, then pull into the Indianapolis KOA on Sunday. About to wrap up our time here in Oklahoma City. Just looked at wunderground for the almanac since we've been here. Whew, it was a scorcher. Average high was 99 degrees, average low was 73. Maximum high of 106. Almost like winter we were in the rig so much. Pool helped, rafting on Lake Thunderbird helped, but it all seemed so temporary. Very few nights sitting outside. Liked the park, liked the people here, but I'm ready to see some lower highs. It's amazing to us how long of a tube some people have tied to the U.S. Mail. "How will I get my mail?" When we initially made summer runs for a couple of months, we had a neighbor pick up our mail and send it to the General Delivery pickup at the local U.S. Post Office. Without question, if you want to see the most inefficient, inconsistent use of your tax dollars, with the worst customer service available, deal with the U.S. Post Office on a weekly basis throughout the country. I'm not saying we didn't have some great Post Offices to work with, we did. But if you want continuity -- forget it. Each summer that followed, the rules had changed. One Postmaster told me I had to fill out a pink card prior to my arrival to be able to pick up the package that I was looking at behind him, and the signature had to be witnessed by the Postmaster. "Um, how can I fill it out before I get here?" More than once I had to go to two or three Post Offices to track down my package. It was a mess. Now that we full time, and our business needs consistency, we use America's MailBox from South Dakota which has been great. Each campground at which we've stayed accepts U.S. Mail for their guests. Having a schedule done through winter of 2011-12, we just set up a mail schedule and have it sent. We're down to only needing it send about every 8 days. If we know we're going to be somewhere for a while, we do have things shipped/sent directly to us at that site. Plus, we've cut our U.S. Mail down to probably 10% of what it was five years ago, plus direct deposit of our commissions has been a great help. One of the first things we learned RV'ing is that the water in campgrounds can be horrible. Some are just awful. We use a filter for the water coming into the rig, but that filter is more to protect the hot water heater and the pipes. We'll cook with that water, but that's about it. During our summers out, we would use those 5 gallon Primo water recyclable water jugs with a dispenser. But, at $6.99/5 gallons, it's hardly a bargain. Now that we full time, we use two 6 gallon containers that we mule to one of those water filtration places you see outside the convenience store (Glacier is a popular one) and some RV parks have one set up. At 30¢/gallon (sometimes 5 gallons for $1) it's a ton more economical than anything else, albeit not nearly the purity but much more consistent. We still keep our Primo 5 gallon bottle, and they do wear out after a while, but it's $7 for one at WalMart empty, we just exchange it after a bit. Reading the many boards, those getting into fulltiming worry about "their stuff" that they've accumulated over the years. There are so many posts about thanking our military, I won't echo every great point. But at some point this weekend, those of us in the U.S. need to be thankful that we live in a beautiful country where we can feel free (and safe) to move about this great land. Anything you can cook, I can cook on the Grill! Ok, I know we have been hitting it hard with the food and recipes. Can you tell we like to eat? Anyway, it has been soooo hot here in Oklahoma that we have not wanted to cook inside the RV. That just adds to the heat and makes the A/C run harder. But, we still need to eat. We recently purchased a new grill so we would be able to have a thermostat and more consistent cooking temps. The thermostat also enables us to use the grill just like an oven. Tonight, we needed to use up some leftover chicken (from the Beer Can Chicken previously cooked). We decided to go with one of our favorites - Bisquick Impossible Pie recipes. All we needed to do was adapt the recipe for the grill. Lower the cooking temp to 350 degrees for 1 hour (indirect heat) instead of 400 for 30 minutes. Worked out great and the RV was able to maintain a comfortable temperature inside. Outside was showing 102 degrees. Enjoy a Safe and Happy 4th of July! Take the biscuits out of package. Dip tops and sides in butter, then in sugar and place on ungreased cookie sheet or pizza pan about 2" apart. Bake 13-17 minutes at 375 degrees. Let cool about 3-4 minutes. While they're baking, combine cream cheese, sour cream and additional sugar in bowl. Blend until smooth. Open the biscuits in half, spread cream cheese/sour cream mix, top with blueberries and strawberries and enjoy! 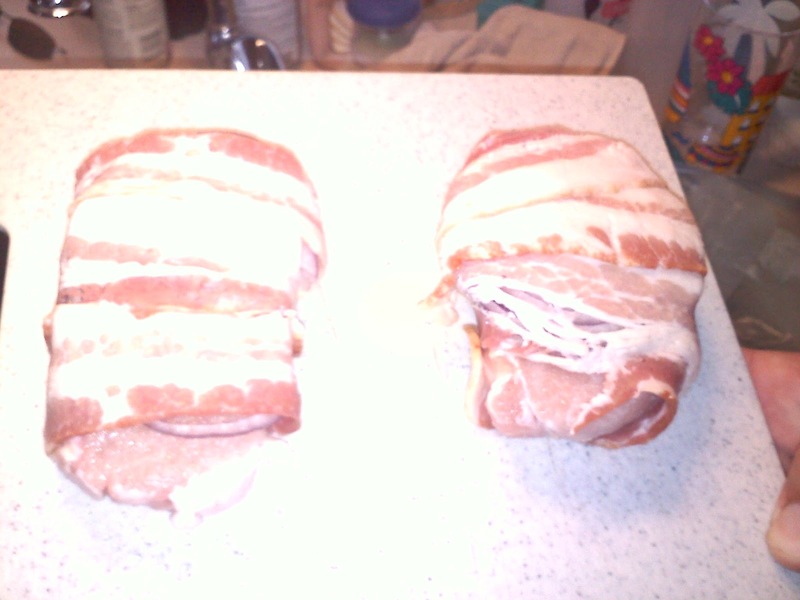 Get two, thick center cut pork chops. Wash them, dry them, then rub them with your favorite rub or just garlic salt. Cut two red onion slices and place on chops. 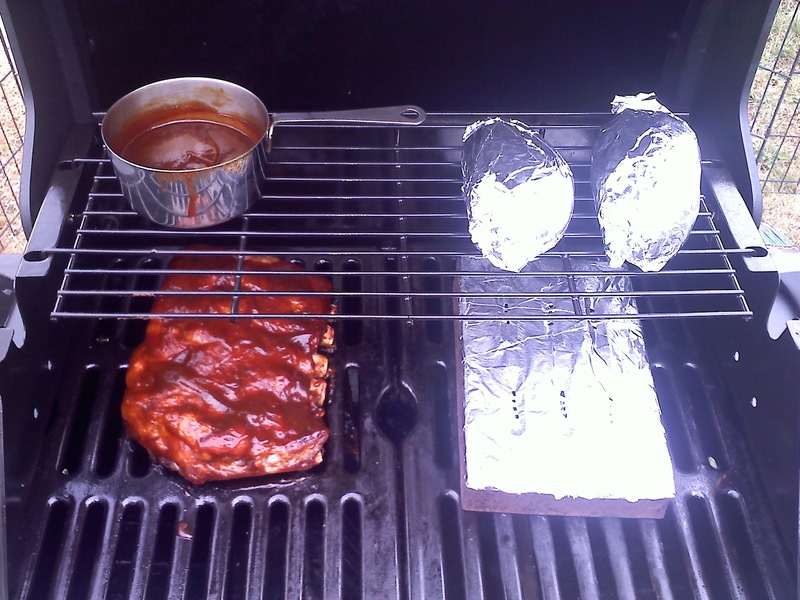 Cook on your grill on indirect heat at 300 degrees, or until a meat thermometer shows 145-150 degrees. Great to see the park filling up for the holiday weekend. Get out there, everyone and enjoy your weekend safely.